Aquarian series above-ground pools give a stylish edge to your back yard and they're a great investment with their timeless durability! These pools will retain their beauty year after year. A great choice as they combine affordability without sacrificing quality. Pool Liners are not included. Click here to shop Pool Packages. Want to see another size? You want a swimming pool liner that is easy to install, lasts, and is the best buy for your money, and Dohenys delivers. 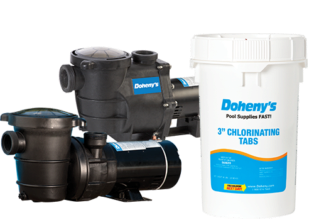 Dohenys Overlap Swimming Pool Liners give you years of enjoyment backed by a 15 year warranty. The extra heavy duty 100% virgin vinyl material provides superior durability for dependable use. Protection against chemical and UV fading to ensure that the liner you have chosen to match your pool and landscape stays beautiful as long as possible. Permanent bonding via high pressure heat for durability. Fits pool walls from 54" (please see our Overlap Expandable Liners for deep end pools with 60"-72" walls). Plus you get an installation guide that makes the installation process easy. Please allow 4 extra days for delivery on select liners. You want a swimming pool liner that is easy to install, lasts, and is the best buy for your money, and Doheny's delivers. Doheny's Overlap Swimming Pool Liners give you years of enjoyment backed by a 20 year warranty. The extra heavy duty 100% virgin vinyl material provides superior durability for dependable use. Fits pool walls from 54" as Noted (please see our Overlap Expandable Liners for deep end pools with 60"-72" walls). Plus you get an installation guide that makes the installation process easy. You get free next day delivery when you choose our bright and clean-looking Solid Blue Liners. Or choose from our selection of liner patterns to give your pool personal style! 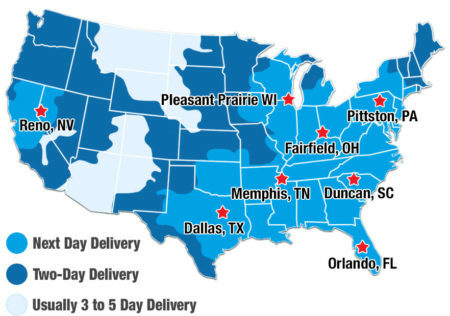 Please allow 4 extra delivery days on select liners. Engineered to blend power and efficiency, Dohenys sand filtration systems provide the ideal balance between reduced energy consumption and outstanding water clarity for above ground pools. Pumps and filters are performance-matched to provide maximum performance and value. All components meet precise tolerances for exact alignment and quick assembly. Strong polymeric filters come complete with a seven position dial valve. System comes with pump, filter, filter to pump hose and system base. Standard three-prong grounded 6 foot cord connection. Systems use AquaQuartz #20 silica sand #5451, or ZeoSand #4429. 16 in. system requires 100 lb silica sand (or 50 lb ZeoSand), 19 in. system requires 175 lb silica sand (or 88 lb ZeoSand) and the 24 in. system requires 300 lb silica sand (or 150 lb ZeoSand). Cost-effective and convenient, Hayward Pro Series Pool Sand Filters offer the ideal combination of energy efficiency and durability. Enjoy outstanding water clarify with the value promise that Hayward delivers on every time. With the help of an integral top diffuser, unfiltered swimming pool water is distributed evenly throughout the entire sand bed in a cascading, umbrella-like pattern. This allows the greatest filtration possible from every square inch of sand. Then the self-cleaning under drain assembly, with its 360 slotted laterals, provides a fast, balanced flow of clear water back to the pool while allowing for more thorough back washing. Best of all, the Hayward Pro Series full-flow technology reduces your energy costs because the pool sand filter operates for shorter periods. A seven-position valve puts you in control. The patented, multiport control valve developed by Hayward was designed with seven swimming pool filter positions: filter, backwash, rinse, waste, closed, recirculate, and winter. An easy-to-use lever-action handle lets you quickly dial any function. Built for long-lasting convenience! You can easily access your Hayward Pro Series pool sand filter assembly for simple servicing via the unique folding ball joint in the laterals. A corrosion-proof housing protects the filter system from severe weather for years to come. Order the Complete System and SAVE MONEY. Complete pool sand filter system includes the Hayward Power-Flo LX Pump, 21 in. complete system includes the Hayward Power-Flo Matrix Pump. Both include modular system base and filter to pump connection kit. Standard three-prong grounded 6 foot cord connection. For sand filtration tanks, use only pool grade AquaQuartz #20 silica sand #5451, ZeoSand #4429, or Aqualoon #7832. up to 18,000 gal./ 8 hours - 100 lbs of sand required. Items 8501 & 8502 are available for Next Day Delivery. Cost-effective and convenient, Hayward™ Pro Series Pool Sand Filters offer the ideal combination of energy efficiency and durability. Enjoy outstanding water clarify with the value promise that Hayward delivers on every time. With the help of an integral top diffuser, unfiltered swimming pool water is distributed evenly throughout the entire sand bed in a cascading, umbrella-like pattern. This allows the greatest filtration possible from every square inch of sand. Then the self-cleaning underdrain assembly, with its 360 slotted laterals, provides a fast, balanced flow of clear water back to the pool while allowing for more thorough backwashing. Best of all, the Hayward Pro Series full-flow technology reduces your energy costs because the pool sand filter operates for shorter periods. Complete pool sand filter system includes the Hayward Power-Flo LX Pump; 21 in. complete system includes the Hayward Power-Flo Matrix Pump. Both include modular system base and filter to pump connection kit. Standard three-prong grounded 6 foot cord connection. For sand filtration tanks, use only pool grade AquaQuartz #20 silica sand #5451, ZeoSand #4429, or Aqualoon #7832. Up to 12,000 gal./ 8 hours - 50 lbs of sand required. This oversized and powerful pool filter system from Hayward sets the new standard for above-ground filtration. The expanded capacity filtration tank is built with glass reinforced, non-corrosive Permaglass XL and will handle large amounts of dirt and debris without trouble for years to come. Quick-release, high capacity air relief valve. Easy-Lok ring design for quick access to all internal components. Standard three-prong grounded 6 foot cord connection. Patented Flex-Tube system efficiently reuses D.E. powder to form fresh cleaning surfaces. Exclusive bump handle activates flex tubes, causing them to instantly purge themselves of dirt and powder. Combination diffuser and lower mixing chamber specifically designed to produce a uniformed coating of D.E. on the Flex Tubes. Perflex DE filters are performance matched with the Hayward Matrix pump series for an outstanding above ground complete filter system. Designed to operate with less resistance than conventional units, these advanced systems produce more filtered water with less pump horsepower. Systems include: Perflex DE filter, Hayward Matrix Pump, ABS modular platform base, union pump to filter connection, and 1.5" hose package. Standard three-prong grounded 6 foot cord connection. Systems use DE (Diatomaceous Earth #5437) filter powder- the most efficient dirt remover known for swimming pools. Adjustable deck height 48-60 inches. Four full treads for easy of climing. Pivotal bottom tread with anti-slip base. Designed to sit close to pool wall for safety. No anti-entrapment barrier required. 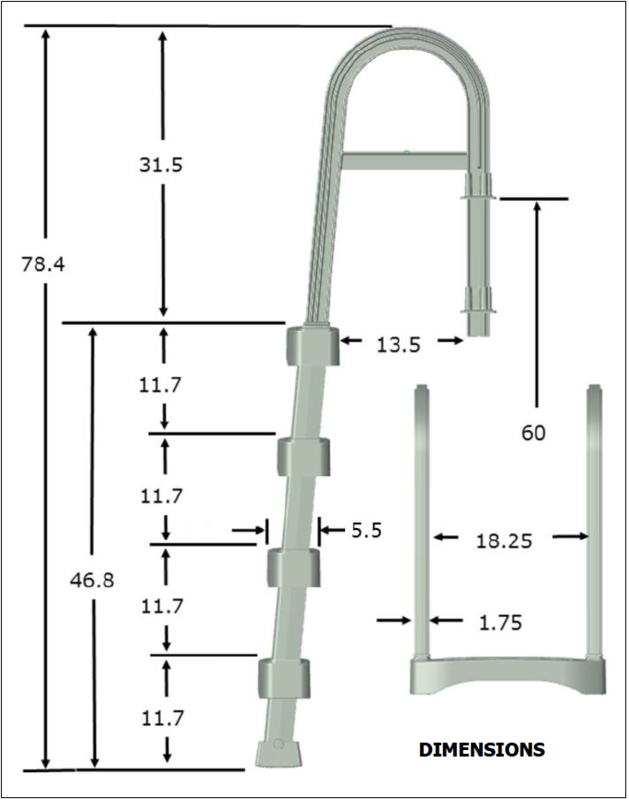 This ladder can be used with pool deck heights of 48 to 60 inches. Can withstand up to 300 lbs. Ladder is extremely easy to assemble. Features four large anti-skid surfaced treads that are 5.5 in. deep. 100% premium resin design. There are no metal hardware in the pool. Simply snap and lock assembly. Ergonomic handrails are 13.5 in. tall. Pivotal bottom tread with anti-slip base. Comfortable tread rise of 11.75 in. Four HD Aiti-Skid Treads, 5-1/2" Deep. For use with taller pools and decks up to 60". Simple snap and lock assembly. Pivotal bottom tread with anti-slip base so you can adjust for safe and stable installation. Comfortable tread rise of 11-3/4" (easy for kids) one more tread than most comparable ladders. Designed to meet or exceed current code requirements. Includes mounting flanges and stainless hardware. Straight up and down in-pool ladder sits close to pool wall for safety. No Anti-Entrapment Barrier required, this straight up and down ladder was carefully designed to sit close to pool wall for safety. Fully adjustable to fit deck heights 46" to 56". Handrails that are 18" wide and 22" high provide for extra stability and security. Designed to withstand weight of up to 250 lbs. One year full warranty. Stylish, sturdy and completely wobble-free! The Slide Lock A-Frame Ladder is designed for easy entry into and exit from your above ground pool. With maintenance-free, UV-resistant resin construction and durable stainless steel hardware, this ladder offers strength, stability and maximum balance. 48-54"" adjustable height. Extended handrails. Anti-skid treading and platform. 300 lb capacity. Pad-Lock not included. To add a stabilizer to your A-Frame Ladder see item #15001. Stylish, sturdy and completely wobble-free! The Slide Lock A-Frame Ladder is designed for easy entry into and exit from your above ground pool. With maintenance-free, UV-resistant resin construction and durable stainless steel hardware, this ladder offers strength, stability and maximum balance. 48-54" adjustable height. Extended handrails. Anti-skid treading and platform. 300 lb capacity. Pad-Lock not included. To add a stabilizer to your A-Frame Ladder see item #15001. Contemporary designed Roll-Guard Safety Ladder is perfect for your above ground pool without a deck. Keep safety in mind with the Lockable Roll-Guard Barrier (lock included). Side rails are curved for extra strength. Inner side rails include integrated side barriers to prevent entry behind the ladder. Minimal hardware needed for easy assembly. Adjusts to fit pools 48-56 in. tall and top seats up to 14 in. wide. Prevent floating by filling side rails with water, no need for sand or bricks. Designed to withstand weight of up to 300 lbs. An excellent option for any above ground pool, the Mighty Step Pool Step provides dependable safety and security. Its designed with large, flat steps featuring non-slip texture. Easy to install, it snaps together for no hassle assembly and includes two handrails for extra stability. The Mighty Step Pool Step mounts effortlessly to your above ground pool or deck with the included brackets and contains side openings for water circulation. A step pad is recommended to protect your liner, and weight is required to prevent step from floating. If you do not have a deck around your pool - make sure to purchase the outside ladder with your pool step. The Confer Curve Above Ground Pool Steps are manufactured to last for years and to impress equally long with its attractive two-tone colors featuring warm grey/beige handles, side walls and hand rails accented by four grey treads. They will complement any pool and can support up to 400 lb. The hand rails slope gracefully and the base pads are adjustable to compensate for slightly dished pool floors. The Curve Base includes the staircase only. The Curve steps are easy to assemble and require no hardware. The treads can be assembled curving outward or inward. For 48-54 in. pools. Complete System requires 70 lb. sand, Step only requires 40 lb. sand, Add-on requires 30 lb. sand. Doheny's Standard Leaf Skimmer - 12 in. x 11.5 in. Doheny's Jumbo Floating Thermometer, 10"